Who is going to be revealed as Angle's WrestleMania 35 opponent? WWE's official website has confirmed that Kurt Angle is going to reveal his WrestleMania 35 opponent on tonight's Raw. Kurt Angle is set to compete in the final match of his storied career at the Show of Shows. 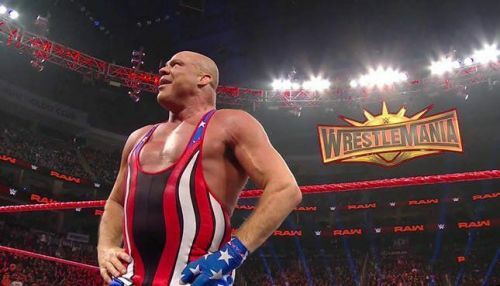 This past week on Monday Night Raw, Kurt Angle announced that he will be retiring after WrestleMania 35, with his final match taking place at MetLife Stadium on April 7th. Angle went on to wrestle and score a win over Raw Superstar Apollo Crews. The speculation mill began spinning almost immediately on social media, as fans threw around a string of names, ranging from Baron Corbin to The Undertaker. John Cena jumped on the bandwagon by posting a picture of Angle on his Instagram. Recently, NXT Superstar Matt Riddle threw in his name to wrestle Angle in his very last match at WrestleMania. Tonight's Monday Night Raw is broadcasting from Chicago, and features the long-awaited return of The Beast, Brock Lesnar. Also, Drew McIntyre gets his chance to "complete the puzzle" by going toe to toe against Seth Rollins. Additionally, WWE has confirmed on the official website that Angle will reveal his WrestleMania opponent on the show, finally putting the rumor mill to rest. Angle's reveal would leave 3 more weeks of build-up before he faces his opponent at WrestleMania. Angle recently did a Q&A session on his official Facebook page, where he answered the burning question on who he would like to face at the Show of Shows. It's likely that Cena will make his return to the company for a one-off match with Angle at WrestleMania. It was Angle who gave Cena his first match in WWE, back in 2002. A match at WrestleMania could bring their story to a full circle. Who will be revealed as Angle's WrestleMania opponent? Sound off in the comments!